Samcro ridden by jockey Jack Kennedy coming home to win the Ballymore Novices' Hurdle during Ladies Day of the 2018 Cheltenham Festival at Cheltenham Racecourse. 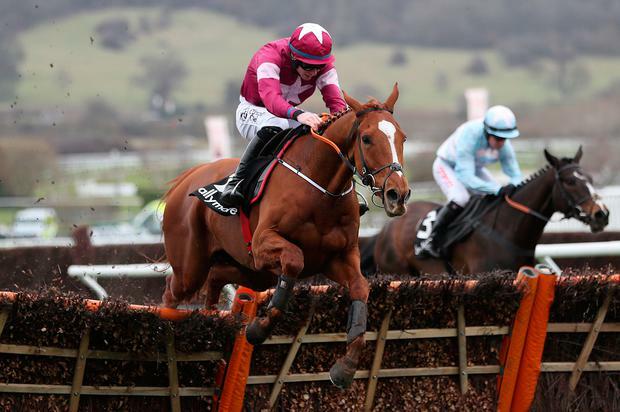 Samcro lived up to the hype with victory in the Ballymore Novices' Hurdle at the Cheltenham Festival. Gordon Elliott's big hope was sent off the 8-11 favourite for the opening race on day two, having arrived unbeaten in six starts under rules. Teenager Jack Kennedy made sure there was no hard luck story by keeping out of trouble on the outside and cruised into contention on the final bend, taking up the running from Vision Des Flos. While Black Op made good headway to break away from the rest, he never looked like catching Samcro and a mistake at the final flight stopped his momentum. Next Destination, off the bridle early under Ruby Walsh, flew up the hill to claim third. Elliott said: "It's a big team effort from everyone at home, and it worked out great today. "There was a lot of pressure, for Jack, for me - for everyone, the whole team. Independent.ie Newsdesk Noel Fehily will have his final rides before retirement at Newbury on Saturday.